I knew my son was destined to serve when from a young age his favorite “game” was to play soldier. As he got older his favorite pastime was paintball, which was another way to play soldier. Our family has a long history of military service as far back as the War of 1812 (my g-g-g-grandfather was General George Armistead Commander of Fort McHenry) and I had always taught him that military service was an honorable profession. After graduating high school he floundered a bit unsure of what he wanted to do with his life, but finally realized that the small town we lived in held no future. He enlisted in the Army to fulfill those boyhood dreams and to take advantage of the education benefits. As usual, being the risk taker he is his MOS choice was 19-D Cavalry Scout. 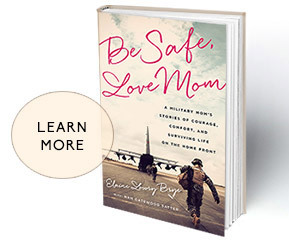 This naive Military Mama didn’t know the extra world of worry she was in for until doing the research. Lord the first couple of years were the hardest but with time I’ve learned to trust the values his father and I taught him, the training the Army has given him, and that those things plus God will keep him safe. As he transitions his Army career now from Cavalry Scout to Recruiter I look forward to him using those seven Army Core Values as he brings in these future soldiers.